One of the perks of having a blog is being able to take a peek at my audience. No, I don't have a webcam view into each of your homes, it's more a general outline of the individuals who visit my site, purposely or otherwise. Blogger gives me a rundown that includes daily hits (number of readers), which posts are being read and the electronic trail they followed to get there. Many of you click a link on Facebook, Twitter or Flipboard; I expect to see that since that's where I post my latest entries. Some of you, bless your souls, punch in the actual blog name to check in on the latest goings on here (I really, REALLY appreciate your dedication!) Blogger even supplies a map of the world with green shaded areas that symbolize where the viewers are located, darker green indicating higher numbers. I always get nervous when Russia—land of the infamous hackers—starts to darken. To be clear, it doesn't tell me who you are, just generalities. Blogger hasn't attained NSA status just yet. Center at Mesa Verde National Park. permission to use it in a book about his work. The most interesting category by far (at least to me) is the "Search Keywords" section. It ranges from the expected (camping in Death Valley) to the bizarre (good things always to copy) WTH? I enable this to some degree; I enter keywords with each post, hoping to catch a reader that's searching for a particular park or trail. 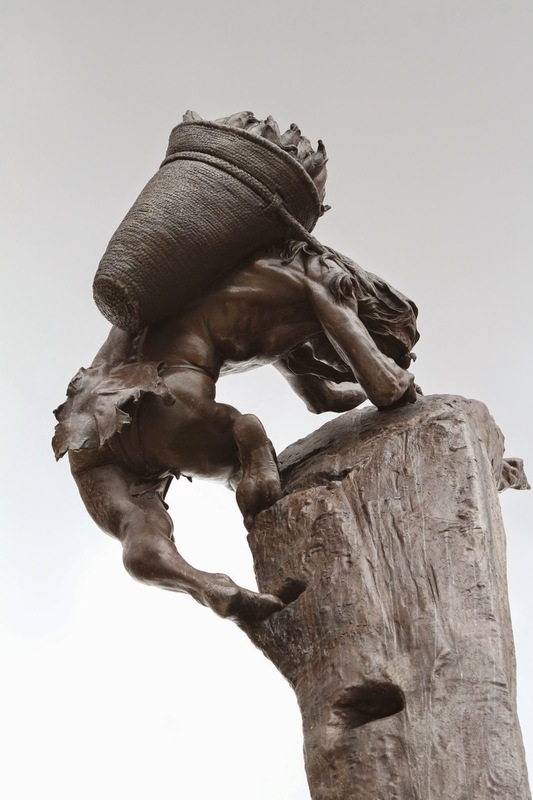 The blog photos often pop up on image searches too: In one instance an artist found a photo we took of his sculpture. He liked it so much he asked permission to use it in a book he was publishing. Pretty cool. A keyword search that popped up a couple years ago made me laugh out loud: "Is there a moose in Grand Canyon?" 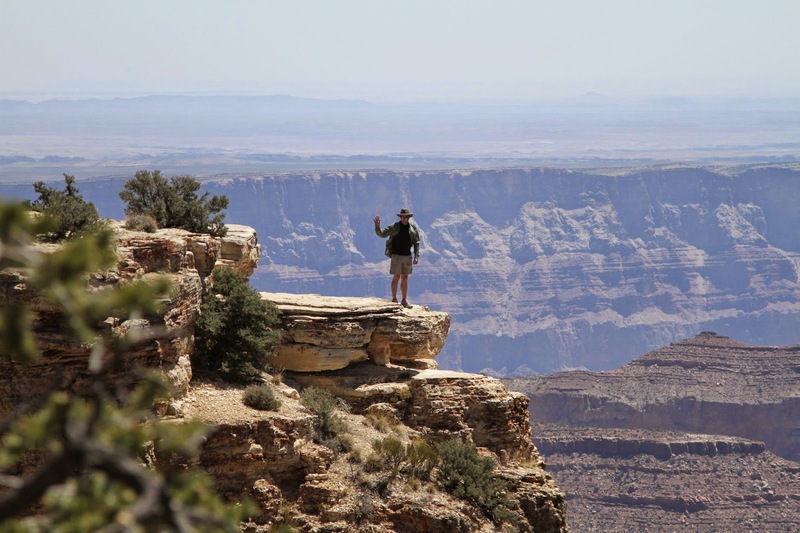 The idea of an 800 lb bull moose tottering along the edge of the Grand Canyon just struck me as funny (and a dangerous prospect for those rafters down below). But then it happened again. And again. Just yesterday, those words appeared for at least the twentieth time. Don't get me wrong. I appreciate the hits no matter where they come from and even more, the curiosity about nature it displays. But since the question has been asked so often I thought I'd take the time to answer. Are there moose in Grand Canyon National Park? It all has to do with habitat. 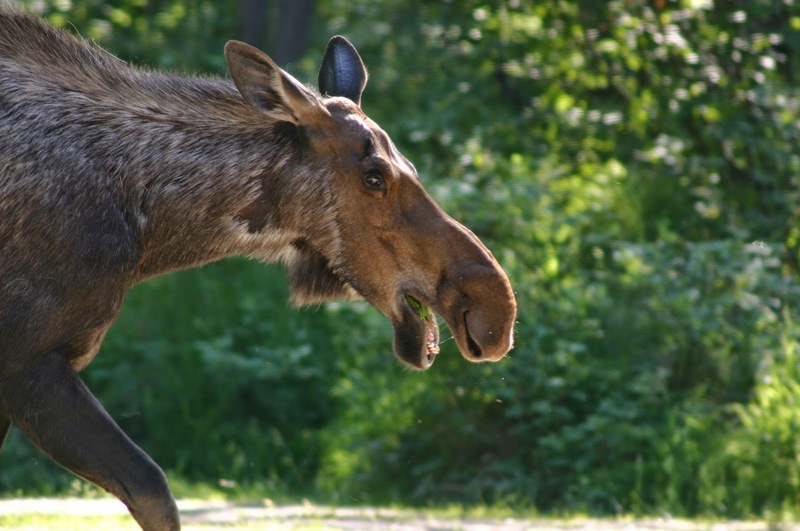 Moose get overheated when the temperature climbs above 60F; they also like to take long, languorous dips in lakes and streams when they start to feel a case of the vapors coming on. The wintertime temps in the park can get plenty cold on the rim, but all the water is down deep in the canyon. During the summer moose would swoon as the temperatures rise to the 80s on the rim and over 100F at the bottom, where the river runs swiftly and surprisingly cold. 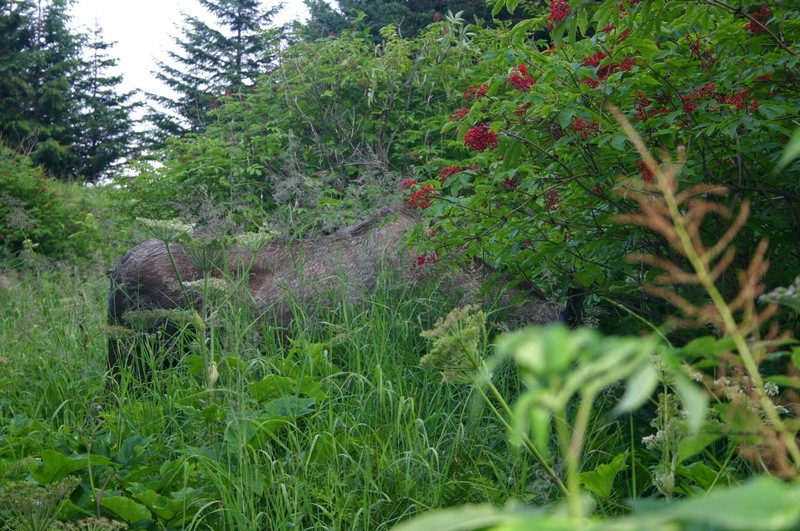 An Alaskan moose enjoys lunch in a beaver pond. Moose need to eat a lot of vegetation to keep their moose-like proportions; they browse on high grasses and tree leaves because it's hard for them to lower those giant heads to the ground. Their long gangly legs terminate in broad plate-like hooves that help to keep them from sinking in the mud and snow, two things not normally found in the canyon. 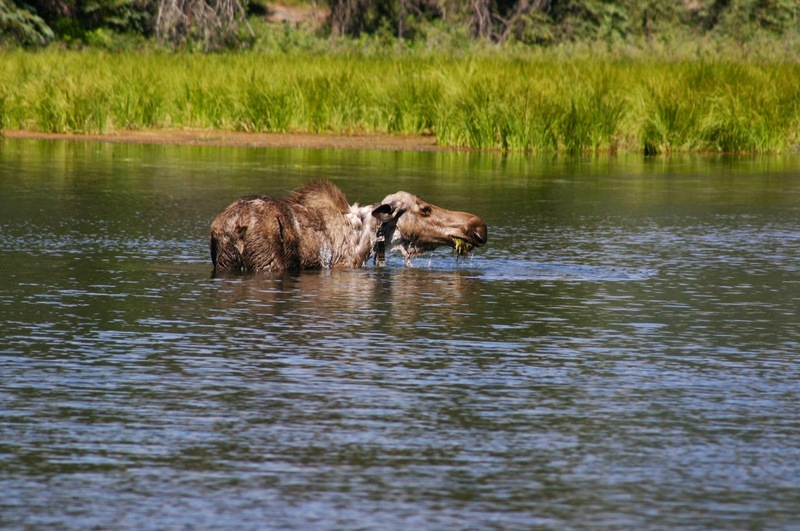 Moose are equally at home in water and land; they are good swimmers and enjoy eating aquatic plants, staying submerged for up to 30 seconds while doing so. Another interesting moose fact I ran across: They can store up to 100 lbs of food in their stomachs. Pretty impressive. 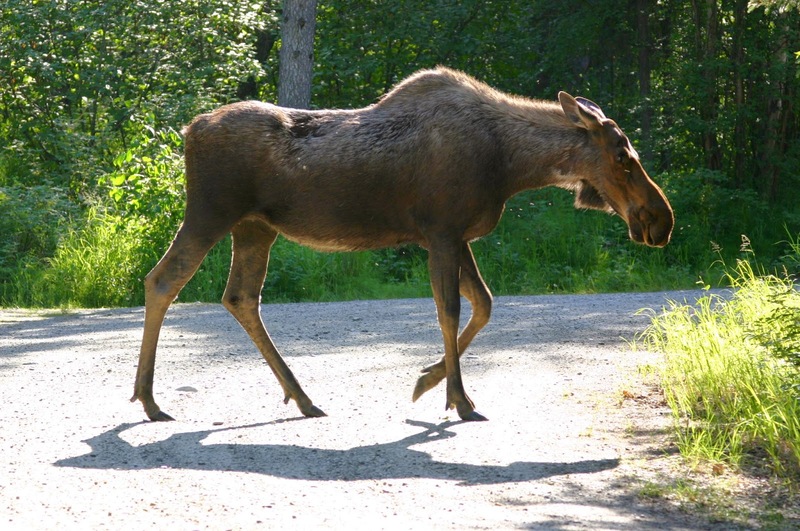 North American moose live throughout Alaska and Canada and in the northern-most states in the lower 48 (Washington, Idaho, Montana, parts of the Rocky Mountain range down to Colorado, Wyoming, North Dakota, Michigan, Minnesota, New England, etc.). They most recently have taken hold as far south as Utah, but only in the cooler northern-most regions there. I don't think they often go down to check out Arches, so don't expect to run into them at the Southwestern Art exhibit in Moab. Mark displaying the international sign for "No Moose Down There." Armed with these facts now, when you visit the Grand Canyon you won't be the least surprised that moose are absent. Both rims have areas with trees and some sparse grassland but it's dry, scrubby pine forest, not ideal if you're a moose. Surrounding the park are vast stretches of barren desert. 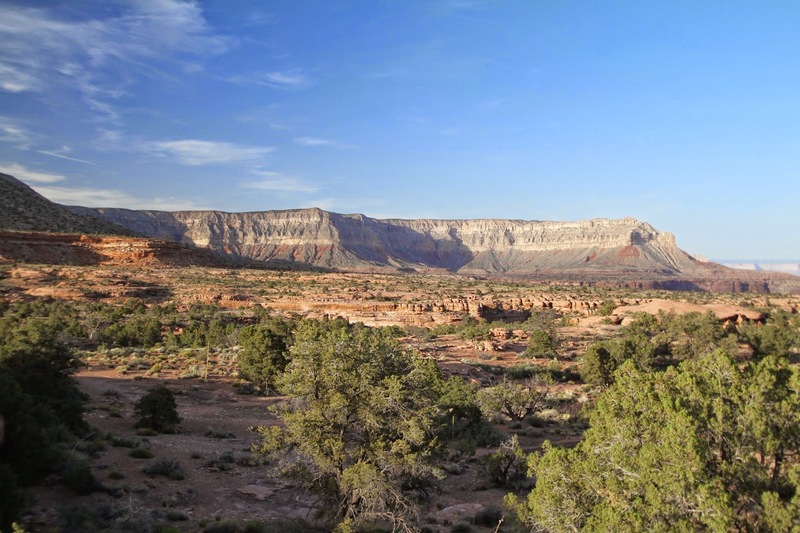 Water is scarce, so scarce in fact that water rationing is a way of life on the northern Kaibab plains. The most expensive pay shower I ever took was in a campground on the North Rim. Five dollars for three minutes. No cheating and adding quarters once you get started: If you couldn't finish in three minutes you were stuck walking around with soap in your eyes. The toilets were composting, no sense in flushing all that good water away. My point being, moose would be dehydrated wrecks out there, nowhere to drink, nothing to eat and nowhere to cool off. If they managed to survive a hike (or fall) into the canyon, it would be so hot they would just wither away. The Grand Canyon Rim. Not a good habitat for moose, but a great place for humans to visit. I have no doubt there will be more inquiries about moose in the Grand Canyon in the future. I picture a school kid, maybe from one of the southern states, about to leave on his first trip west. Hoping to cram in all the sights he's always dreamed about, he punches into the search bar the two things he really wants to see: A moose and the Grand Canyon. I hope this page pops up next time and is helpful to explain why they aren't going to be in the same place. I hope you're not too disappointed kid. But hey, the Grand Canyon is pretty cool, you'll like it. Just tell your parents the next trip out you need to hit Yellowstone. They've got some mighty big moose up there. Now I'm off to figure out what those "good things always to copy" could possibly be. I confess I have very little interaction with anyone in the military and I myself would never consider joining. I'm a bit of a pacifist and an even bigger baby; the thought of killing anything makes me queasy, and the thought of someone trying to kill me makes me want to curl into a ball in the back of the closet. I grew up during the Vietnam war, although I wasn't even aware of it at the time. I wasn't yet born when it started and it ended when I was ten. I'm not sure if my parents tried to shield me from it or if I was just oblivious. We only had one television in the house and my only memory of it was watching Gilligan's Island when I got home from school. I never saw those infamous news clips of the fighting over there. As a kid my family consisted of my parents and brothers, and some older relatives on my father's side. By sheer luck or timing, none of my relatives on that side served in the military. My grandfather was a welder by trade, and he did some ironwork for the war effort during WWII but never actually joined. My great-grandfather was married with children before WWI broke out and owned a sheep ranch; I assume some of the wool went to the war effort there as well. I didn't really know my Mom's side of the family; she grew up in Seattle and that's where most of them lived. Kids live their lives in such a small radius, anything outside the circle doesn't seem real. I knew I had uncles and cousins but had only met them once or twice. My mom had some pictures, but a kid has things to do, friends to play with, who has the time to look at some old black and white photos? My crazy uncle turned up in San Francisco at some point during my grade school years. I don't remember exactly the day I met him, but he made quite the impression just the same. He drove an AMC Pacer, the smashed back bumper tied on with brightly colored hair ribbons (probably the first thing he could find at the nearest drug store—he was both poor and not very mechanically inclined). Every now and then he'd show up at our house, roaring up the street in that goldfish bowl car, parking it willy nilly and rushing in the front door in a cloud of cigarette smoke. His mustache was always carefully waxed into a curl like a New Age Snidely Whiplash and he dressed in the latest hippie fashion of the day, all vests and bell bottoms. He loved everything new. He was the first to buy a laser-disk system (the precursor to DVD as it turned out) and he always had the latest (and biggest) television to go with it. He bought us the best Christmas gifts we could imagine, sometimes things we didn't even know existed. One year a tiny transistor radio, the next a calculator that actually added, subtracted, multiplied AND divided for you! (This was the 70's after all. It's hard to remember that those things were cutting edge and very expensive back then.) When Star Wars came out he took us all to the biggest screen theater in San Francisco where we stood in line for two hours and sat in the front row, starships zooming over our heads as the latest THX sound system rumbled our seats. He was an artist and always struggled to make a living. He finally got a "real" job as a long distance operator translating for Japanese callers trying to reach relatives in the U.S. I never once wondered how the son of an Italian immigrant who grew up in Seattle learned to speak Japanese. It was just something Uncle Steve knew how to do. Hindsight is always 20/20, as they say, but it can also slap you in the face and remind you just what an oblivious idiot you can be. My uncle was a medic in Vietnam. He didn't show up until later in my childhood because he was busy patching his fellow soldiers back together, that is until he contracted malaria and was sent to Japan to recover. He spent six months in a hospital there, learning to speak Japanese for lack of anything else to do. He came home physically weak and mentally scarred, struggling (I'm sure) with how to exist with the memories he carried in his head. He married then divorced, moving around the country looking for his place in the world. He lived in Atlanta for a while, moving back when the southern way of life started to grate on his bohemian nerves. He tried his hand at being a monk, giving away his worldly possessions and moving into a seminary in Massachusetts. After a few years, he gave that up and moved back to California, getting a manufacturing job nearby so he could be close to his sister. I only remember one instance of him talking about the war, and that was just a few years ago. He told us he was waiting by the side of a field with his unit, just another day "on the job." A soldier was walking across the field toward them when he stepped on a mine. My uncle said it looked like a cartoon, detached arms and legs flying out from the center, the center of course being a body that was reduced to the red mulch that rained down on their heads. There was nothing really to do but pick up the pieces and stuff them into a body bag. 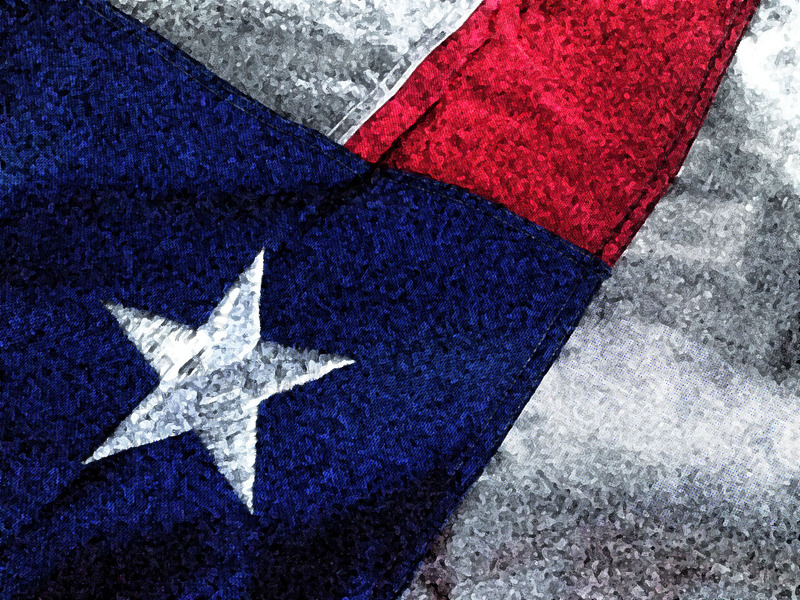 We're told to thank the men and women who have served, and be grateful they have protected our way of life. Of course I am thankful. But it seems like the phrase "Thank you for your service" has been reduced to a greeting—"thankyouforyourservice" "haveaniceday" "how'reyoudoing? "—and has ceased to have any real meaning. Besides, what can a returning soldier, with visions in his head like the one my uncle shared with us, really take from a thank you? Politicians talk about sacrifice and bravery and flags get put out on porches and the mall holds a big sale. I'm sure that makes veterans feel awfully proud. My uncle's demons never left him. He died alone in a condo filled to the brim with things he had purchased trying to fill a void that couldn't be filled. It was sad and heart wrenching and I'm sure it happens every day which makes it that much more sad and heart wrenching. So today I will remember my uncle as I knew him: funny, generous, artistic, and genuinely, comically mechanically disinclined. I will be thankful for the people who were willing to spend part (or all) of their lives in the military following orders, doing things no one should ever be asked to do. How can a civilian like me possibly understand what it's like to be in a situation like those faced by military veterans? I can't. By way of thanks, though, I plan to listen to their stories, pay attention when conflicts around the world arise and most importantly, hope against hope that someday we'll all learn to settle our differences without sacrificing anyone's life or sanity. And to all the Uncle Steves out there: Thank you for your service. Sincerely. 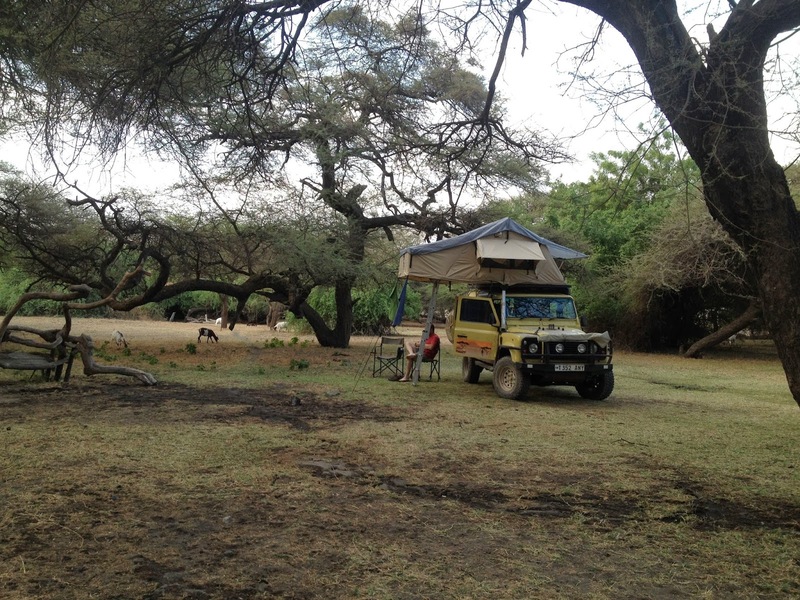 When we arrived at Lake Natron, we checked into the campground with high hopes. 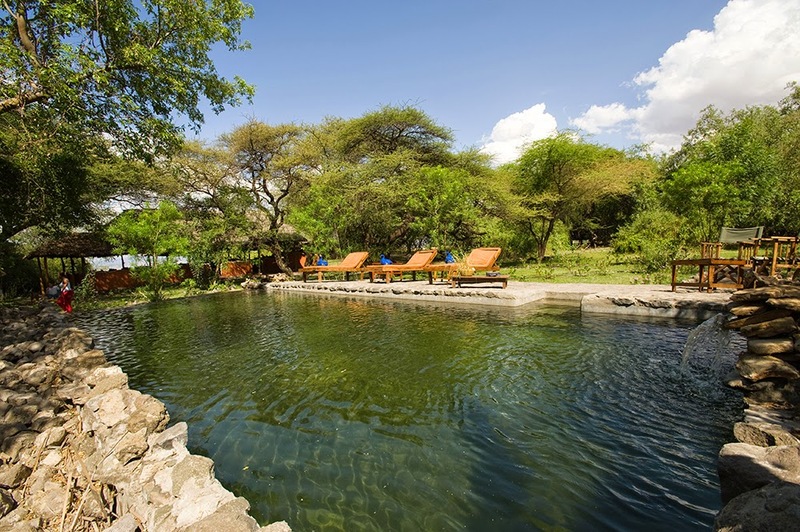 The Moivaro Lake Natron Tented Camp was purported to have both a restaurant and a swimming pool, two luxuries that had not been present at any of our other stopovers on this trip. We had learned to lower our expectations when it came to amenity listings, but hope springs eternal: At this point in the trip, crocodile-free water and food that was cooked by someone else would be 5 stars in our book. Once we finally found the campground (there were at least two other campgrounds that went by the name "Lake Natron Tented Camp" one of which we mistakenly pulled into before realizing our error) we were met by our Maasai host, who hopped onto the running board of the Land Rover and guided us to a spot on the grassy campground, ducking as we drove under the thorny acacia trees. Once parked, we spilled out the doors in what I can only assume was a shocking amount of dust and sweat, exhausted from the eight hour drive from the Serengeti. Mbiraru, our host, signed us in and gave us the tour. A nice garden area surrounded the luxury tents where the more posh guests were staying. 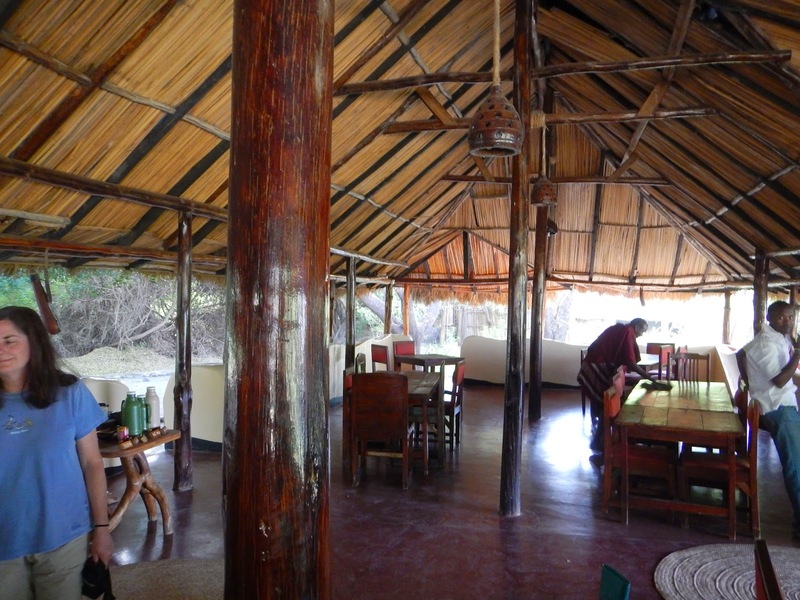 In the middle of the tents (which were in reality closer to cabins, equipped with full bathrooms, running water and king size beds) was a thatch roofed open air restaurant and bar, a heavenly sight. Off to the side, a small natural swimming pool fed by water piped in from the nearby river. One of the guests was swimming laps as Mbiraru walked us by. "The pool comes with hippo." he said with a sly grin. One of the "tents" of the Lake Natron Tented Camp. We were the only ones in the campground. 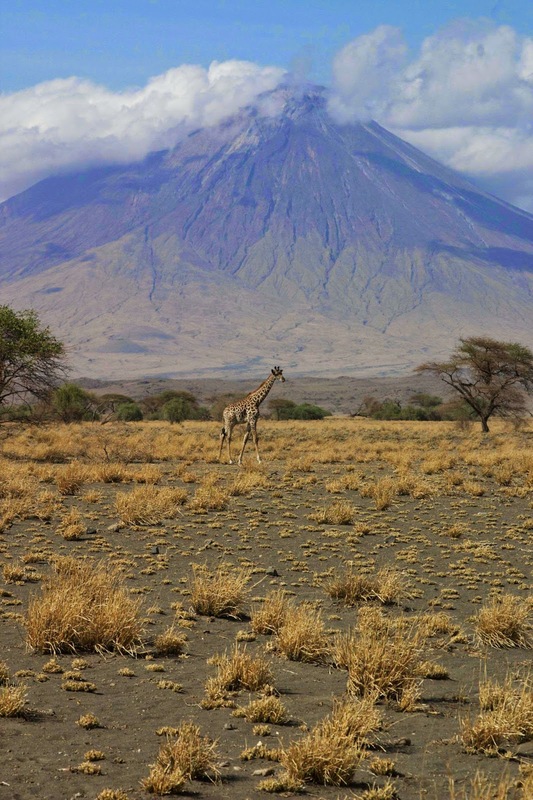 Lake Natron is not nearly as popular as the other parks in Tanzania, and camping is not nearly as popular as traveling with an organized resort tour. The attractions there are the flamingos that gather on the lake and climbing Ol Doinyo Lengai, the active volcano on the southern edge of the lake. 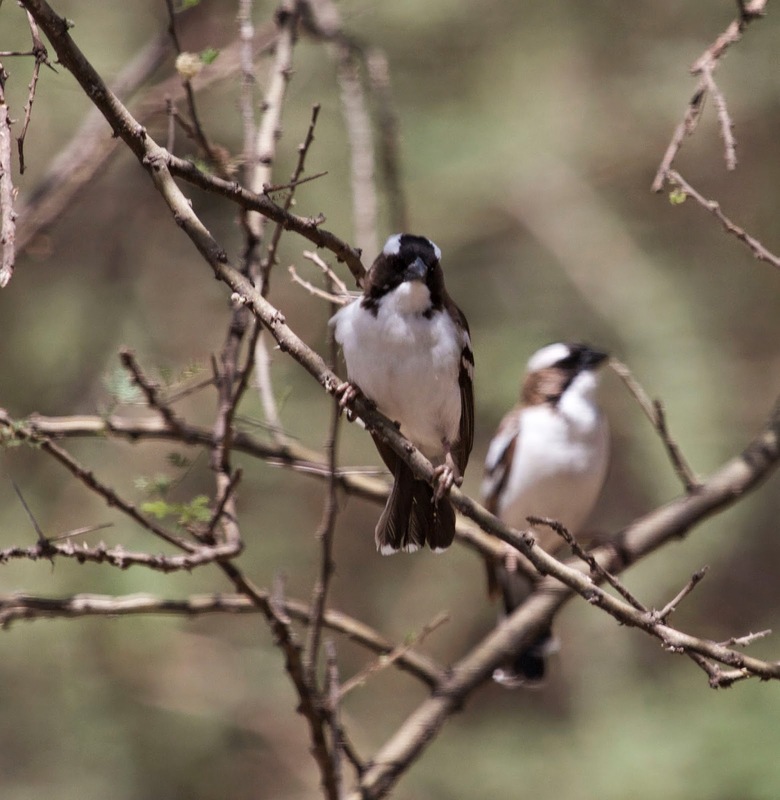 It's remote country, eight hours of rough road from Serengeti, and seven hours from the nearest town, Mto wa Mbu, to the south. In between is a whole lot of dry plains and rocky mountains, not the romantic big game areas for which Tanzania is better known. yet felt much more luxurious than it looks. Mark did a quick change and we headed back to the pool. I sat on the edge and stuck my legs in, watching Mark swim laps with the other guest we had seen earlier. We found out he was visiting from China and was here to climb the volcano, having already climbed Kilimanjaro earlier that week. He was here with a group peak bagging in Tanzania and Kenya and, as far as we could figure, completely ignoring the animals and other attractions Africa had to offer. To each his own I guess. Birds were everywhere in the trees over camp. 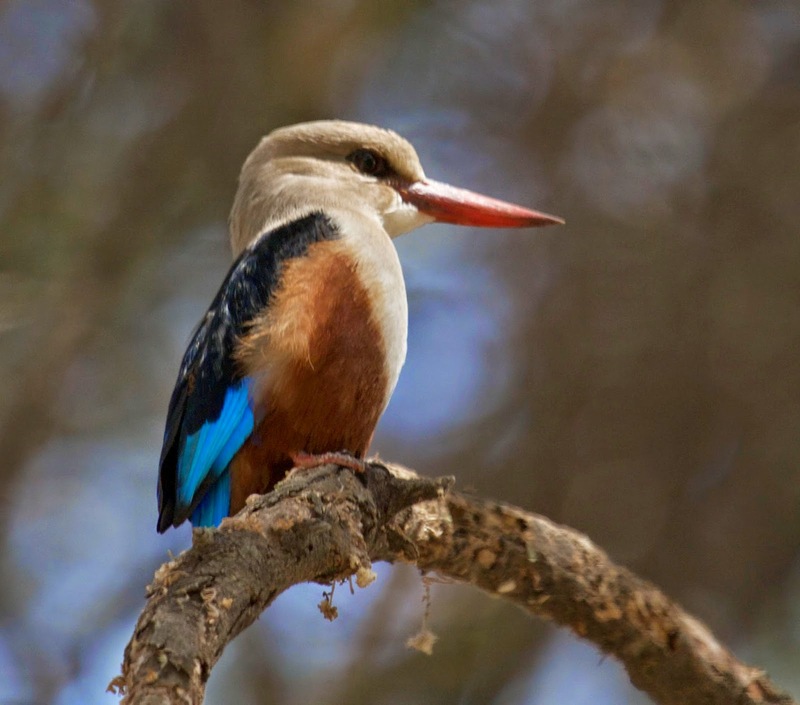 A colorful kingfisher looks down at us. After the swim we walked back to camp and took a shower, more luxury than we had thought possible on this trip. The showers were dark rooms made of rough wood poles with a thatched roof, a small window cut into the back for ventilation. The water came from large black tanks warming in the sun on the roof. There was no temperature adjustment, just on and off, but the weather here was so hot and we were so sweaty and dusty it felt magnificent. I stood under the water much longer than necessary just enjoying the smell of soap; when soap smells so intoxicating, you know you've gone too long without it. Back at camp we dug through our suitcase looking for something presentable to wear to dinner. We were still the only campers there, but we had plenty of company. A herd of goats grazed all around us, escapees from the Maasai herds that lived in the area. Periodically one of the staff would walk through, shooing them out of the campground. Mark relaxes before dinner, watching the goats eat theirs. It seemed to take forever for six o'clock to come. We gussied up as best we could and walked over, trying not to be the first to arrive (but of course we were). Mbiraru met us and sat us down at a table for two, a white tablecloth and actual ceramic plates and silverware. Luxury! He brought us some bottled water and drinks, then returned holding a gigantic leather-bound menu from which he read the evening's fare. "Tonight, we have a four course meal planned for you: Tuna salad, pumpkin soup, beef over potatoes and vegetable, and chocolate almond for dessert." Sounded good to us! The restaurant. Notice the lights hanging from the rafters: bat heaven! It was a pleasant dining experience. The pumpkin soup in particular was excellent, seasoned with unfamiliar and wonderful spices. 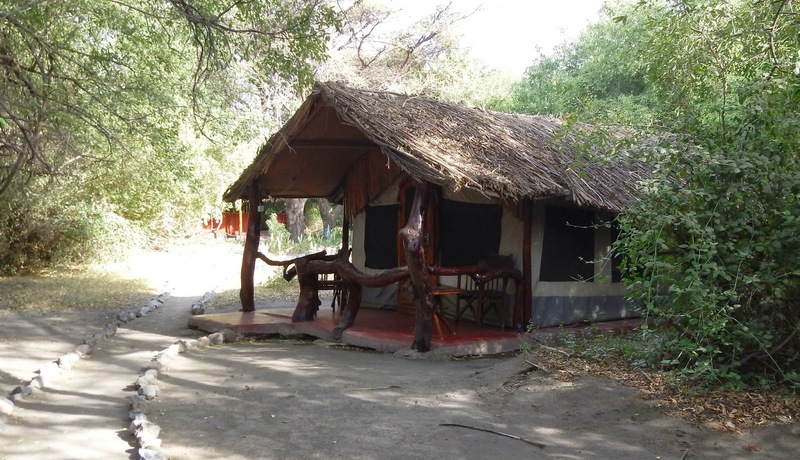 Every member of the staff was Maasai, dressed in the traditional robes and jewelry, which we thought was a refreshing change from the polo-shirt-and-khakis-wearing lodge workers we had seen in other parks. A boisterous group of Australians (is there any other type of Australian group?) were sitting at a long table behind us, ordering rounds of drinks and shouting about their upcoming hike on the volcano the next morning. The place was filling up. 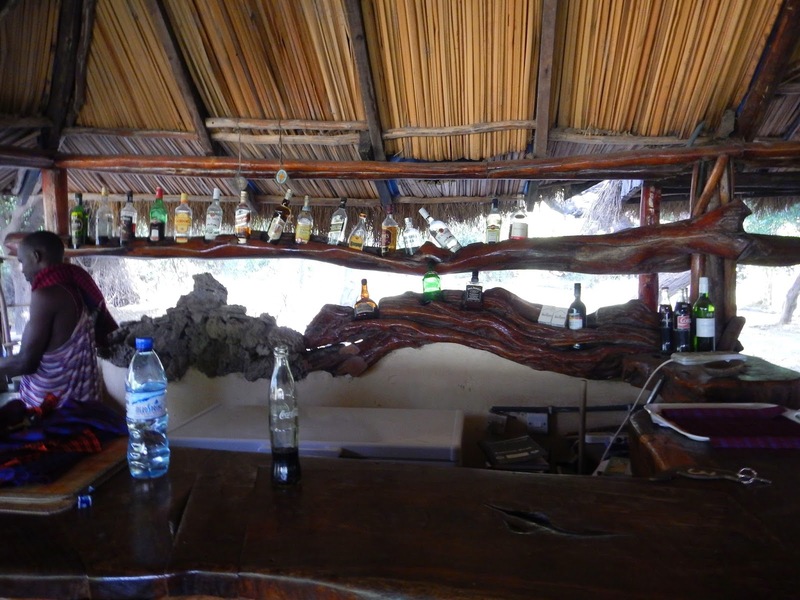 The bar, with it's hand-carved tree trunk with custom liquor bottle holders, scotch on the far left. Since there was no electricity in this area, a generator hummed in the distance from over by the kitchen. It supplied power for the lights and the big chest refrigerator that held the beer, water and sodas. As the guests filed in we noticed they each gave their cell phones to the barman, who plugged the phones into an impressive array of power strips that bristled with charger cords and splitters. It reminded me of the scene in Christmas Story where Ralphie's father plugged the tree lights into the wall. I was waiting for giant sparks to fly out and the whole place to go dark (it never did). All good things must come to an end though, so after Mark finished his glass of scotch (which he had been planning since spying the Glenfiddich bottle behind the bar on arrival) we paid up and walked back to camp, our stomachs ready to burst from the four courses, three more than we had been accustomed to lately. Back at camp the goats had gone home, but the bats were happy to keep us company. 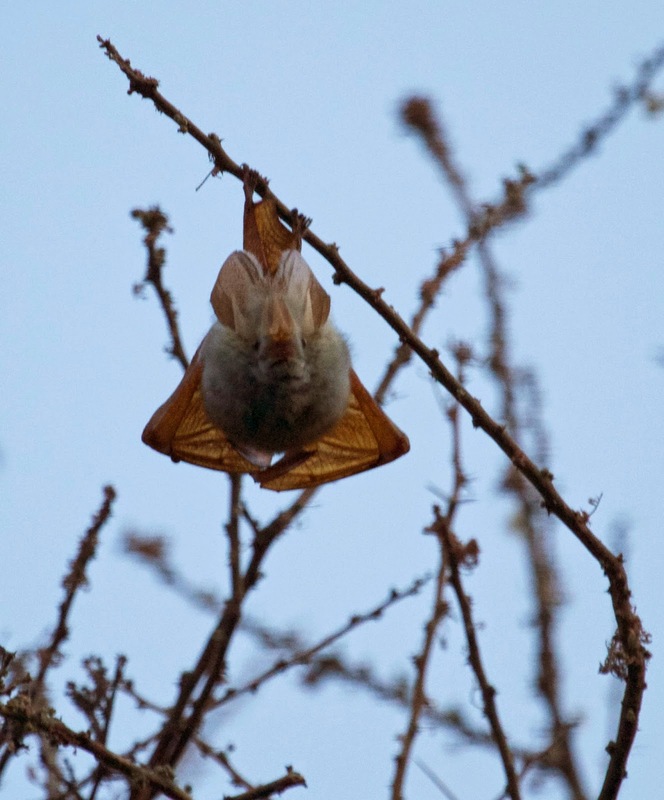 One of the curious Yellow-winged bats hanging out above our camp. The next day we spoke to Mbiraru while we sat at the bar slurping Cokes. He was the assistant manager there and was doing the books while he doubled as bartender. He told us the camp was built by an Englishman, but later sold to a local Maasai man who employed workers from the surrounding villages and trained them on the job. It was nice to know the locals were profiting from the place; most if not all of the lodges we had seen in the parks were foreign owned. Mbiraru told us he learned English in school, but picked up many more languages while working with the tourists. He said he probably knew fifty ways to say hello and goodbye, using english as a default. We asked him how he knew we were American right off the bat, before we even spoke to him. He said after awhile you just know (although he admitted he thought we might be Canadian at first but went with American at the last minute). As we sat there we noticed he switched effortlessly between languages when other groups approached him. It seemed mind boggling to me, but he said he'd been at the job for several years and it came naturally now. 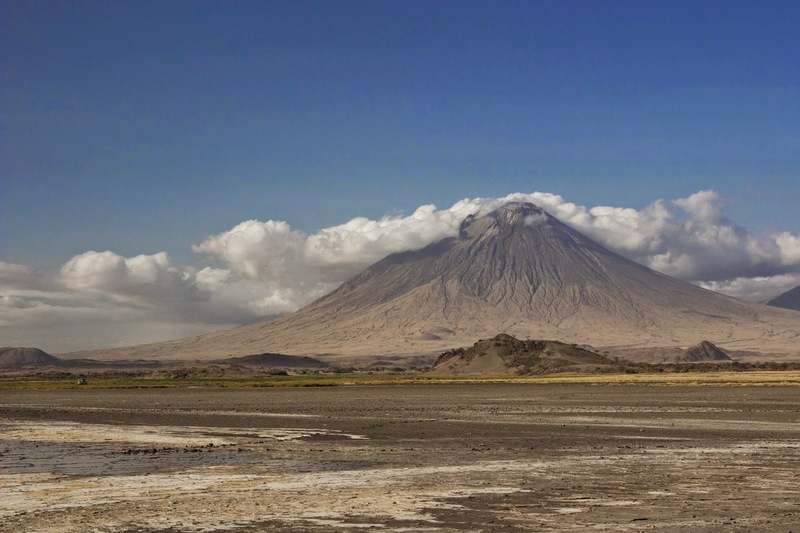 Ol Doinyo Lengai rises up on the southern edge of Lake Natron, where groups of hardy tourists are guided to the top by groups of patient and long suffering guides. A group of angry sounding Chinese tourists were sitting in the restaurant behind us, talking with their tour guides through the group's interpreter. We got the scoop in a hushed tone from Mbiraru: Apparently the group had hired a company to take them to the volcano. Halfway up, one of the group decided it was too hard and turned back. That woman was accompanied down the mountain by one of the guides, where the two of them waited at the car until the rest of the group returned, leaving the rest of the group on the mountain with only one guide. The woman had wanted the guide to drive her back to camp—a 10 kilometer drive—then return and hike back up the mountain to help the others on the descent. The guides argued (in the most diplomatic way possible) that it was not part of the contract to drive the route twice. In addition, it was a lot to ask a guide to hike the arduous trail twice, considering the difficult terrain (slippery pumice and ash) and it was not safe to do so alone in the dark. The Chinese interpreter insisted they would not pay the bill, that they were unsatisfied with the tour. It seemed they were at an impasse. The guides sat with tired looks, swiping the sweat off their foreheads, unsure what else to say to convince the group. This all took place at two in the afternoon. The volcano hiking trip had started at 2:00am to avoid the heat of the day on the black, treeless volcano. Everyone was exhausted, with the exception of the Chinese interpreter. She seemed to revel in the conflict, sure that she would win this round. Finally a driver showed up with a printed copy of the release forms, where it clearly stated the tour guides were in the right. I felt sorry for the poor guys. The tour company got paid, but I highly doubt the guides themselves were tipped for their services. We wanted to buy them a drink, but they disappeared as soon as they settled up, probably strait to their beds since no doubt they had another group of prickly tourists to ferry up the mountain in the morning. What a way to make a living. 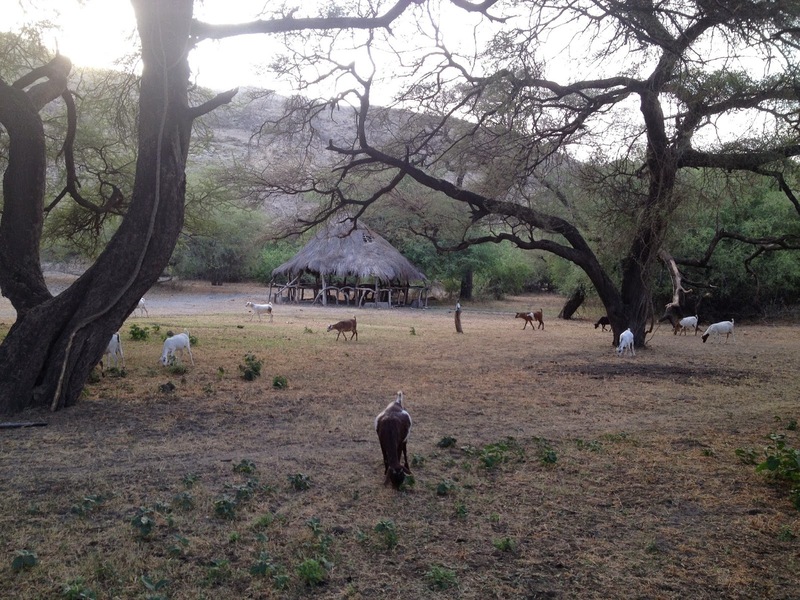 Goats surround us at breakfast, Lake Natron Tented Camp. I think Lake Natron was my favorite stop of the trip. It was a beautiful place to rest up for a bit before taking on the next round of corrugated roads. Even better, we had time to get to know the local people and get a sense of what it's like to live in Tanzania. Rattling around in our Land Rover on game drives? Thrilling. Finding out the Maasai actually have pockets sewn into their robes to hold their cell phones?